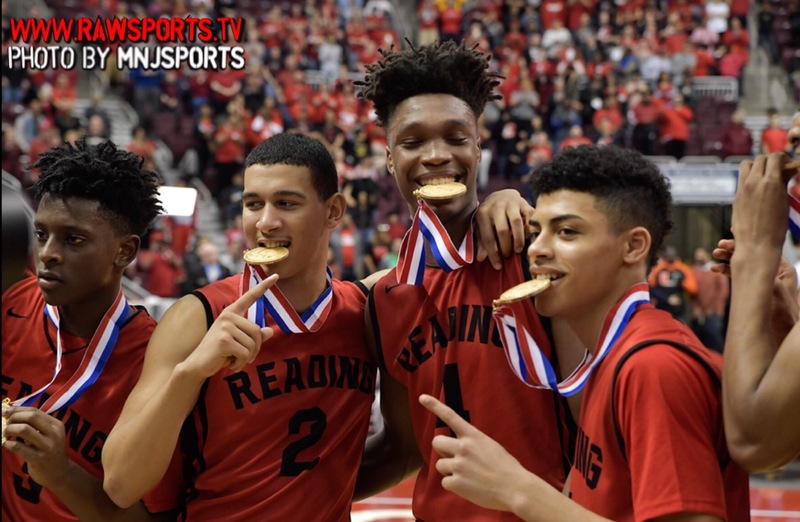 HERSHEY, PA (Giant Center) — On 3/25/17, In front of a record breaking crowd at the 6A Boys Basketball State Championship, Lonnie Walker capped off his final high school game with 22 points and 8 rebounds to lead Reading to their first ever state title. The score remained close throughout, with Pine Richland going into the second half up 30-28 after hitting a buzzer beater layup and shooting 20% better than the Red Knights during the first half. Phil Jurkovec, Pine Richland’s guard and a standout sophomore quarterback who is already a hard commit to Notre Dame for football, led the way with 14 points while three other Rams players scored in double figures. Sharpshooter Tyrone Nesby IV added 11 and Jose Genao Batista scored 14 to help Reading beat Pine Richland by a final score of 64-60. With just over one minute left, Walker threw down a breakaway dunk to seal the game as the crowd of more than 9,000 started chanting “Lonnie! Lonnie! Lonnie!”. Red Knights Coach Rick Perez will now look to prepare for next season without the likes of his star player as Walker moves on to the University of Miami, with a Pennsylvania State Championship under his belt.